Hi guys! Every year merchandizers try to invent new ways to attract the customers. We are all used to the loyalty programs, bonus cards and so on. But what about this scheme: you just enter the shop searching for the necessary product and the shop assistant gives you what you want? You may think that this is magic or a psychological trick, but there are always technologies behind every hocus pocus. Today I will prove you that this is possible nowadays thanks to the Nucleus Vision project. In this article the mystery will be puzzled out, so read more to find out how this works. The solution offered by the Nucleus Vision company is initially aimed at the retail industry. The Nucleus Vision product is already being used in the Giny & Jony kids-wear retail network in India to already provide personalized service to customers on their mobile phones. Thanks to the data network shop assistants and merchandizers can access the latest client data to improve customer experience. The only condition: the client must confirm his/her consent for Nucleus Vision loyalty program participation and data sharing. This becomes even more possible and realizable due to the global mobile devices users increase. Interestingly, the technology used does not need any RFID, WI-Fi, Bluetooth or any face recognition technology for client identification. 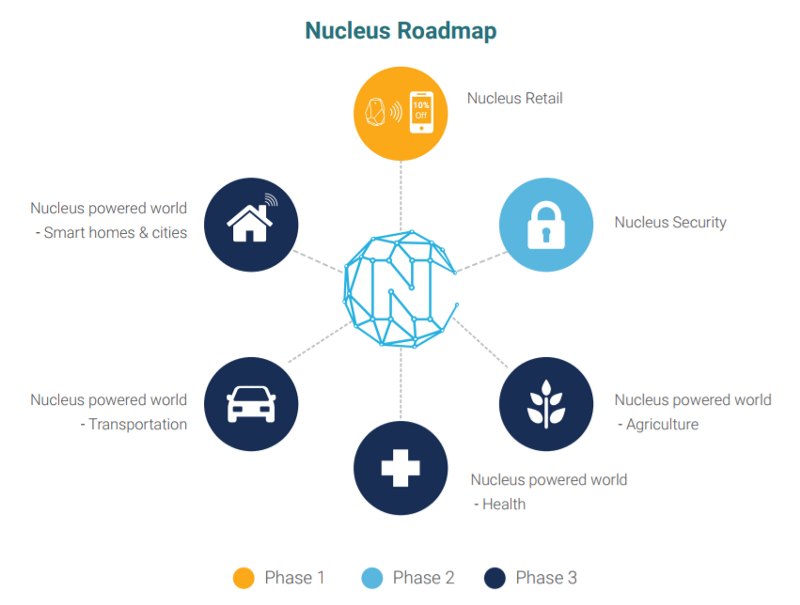 The Nucleus Vision solution functioning depends on four core elements. 1. ION Sensor. This one is used to provide the Nucleus network the client phone identifier. Besides, it can measure such ambient characteristics as temperature, pressure, motion (in particular, acceleration) and sound. 2. Orbit Blockchain. This is the platform to facilitate the secure transfer of identifiers, data and tokens between all participants. 3. Neuron intelligence platform. This is the solution that combines the advantages of deep learning, blockchain and Internet of Things. Thanks to this platform, retailers can know for sure when their interference in the client shopping process could have the best impact. 4. nCash tokens. These are used as a reward for clients and partners in the Nucleus system. The tokens can be redeemed and also be traded on the exchanges. Thus, the Nucleus Vision solution leverages the advantages of the Internet of Things and blockchain technology. Besides, the client recognition is possible thanks to the special Nucleus ION sensors, allowing real time identification of the people passing by the sensor recognition zone. For this process, phone identifier reading is carried out — no matter what phone is used — a smartphone or a feature one. The identifier is sent to the Nucleus network and then linked to the client profile which facilitates the notification about this very client entering the store. The client receives a notification on his/her phone about the opportunity to participate in the reward program of the store. If the client opts in, the nCash tokens are transferred to his/her account. The customer ID is sent to the seller through the blockchain that makes this process safe. There may be some new client data added in the system. In case there are no customer data in the store system, it automatically refers to partner systems, which, however, cannot share the client information without his/her consent. To incentivize the both parties to share the information needed, the reward in nCash tokens is offered. After the client allows data access, the system database is filled with the new dataset. This is carried out with the help of intelligent Nucleus system. Based on this data, the customer’s value score is generated. The retailer can use this score to determine the behavior in relation to the client and the ways to motivate him to visit the store once again. In order to bring the plan into reality, develop the platform and ensure the global adoption of the solution, the team launches the ICO. The dates were not announced yet, see the official site for updates. For now, the funds of 30M out of the ambitious 40M USD were raised on the Presale. The ICO token price is set to 0.01 USD for 1 nCash which will be used for various transactions across the Nucleus ecosystem. You can also support the project by participating in the variety of the bounty campaigns (for terms, see the links below).